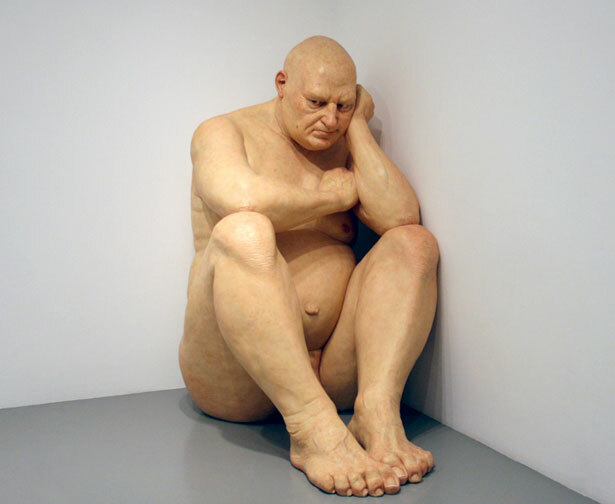 On a recent Washington D.C. trip I saw some of Mueck's work in-person including the below pictured: Untitled (Big Man) (2000). The "Big Man" is, well... big. I couldn't find measurements but I'd guess the sculpture was 7' in its presented form. Due to its realistic nature it felt as if the sculpture could rise at any moment, put aside his sulking, and wreak havoc on the inconsiderate tourists and photographers disturbing his solitude. Here is more of Mueck's work and other sculptures by similar artists.